The Duchess of Cornwall in 2011. She was born Camilla Rosemary Shand in King's College Hospital, London. She grew up in Sussex. She has a sister, Annabel Elliot (born 1949) and had a brother, Mark Shand (1951-2014). Prince Charles and Camilla married each other on 9 April 2005, and she started to be called Her Royal Highness The Duchess of Cornwall. When their engagement was announced, it was also said that she would not be known as The Princess of Wales. This was because Prince Charles' extremely popular first wife, Diana, Princess of Wales, held that title from 1981 until her death in 1997. The relationship between Camilla and Prince Charles began when they met at a polo match in 1970. Camilla was seen to be an unsuitable match for the future king. The Duchess now makes many visits, mostly in Great Britain — often with Prince Charles, but sometimes on her own. She lives at Clarence House, which is a part of St James's Palace in London (very close to Buckingham Palace). She lives there with Prince Charles and his sons, Prince William, Duke of Cambridge and Prince Harry. Camilla was married once before, to Andrew Parker Bowles — from 1973 until they divorced in 1995. The couple had a son, Tom and a daughter, Laura. Tom is married to Sara, and they have a daughter, Lola, born in 2007 and a son, Freddy, born in 2010. Laura is married to Harry Lopes, and has a daughter, Eliza, born in 2008 and two sons, Gus and Louis, born in 2009. 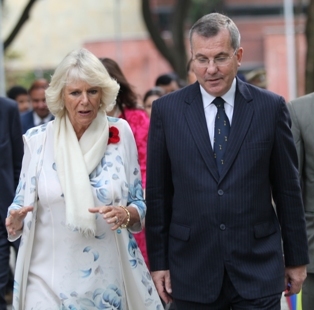 Camilla, Duchess of Cornwall Facts for Kids. Kiddle Encyclopedia.